The process for marble cleaning entails a wet polishing system that leaves a clean smooth surface creating no dust. This fresh surface will enable the stone to be properly polished to the client’s specifications, allowing the natural luster and color of the stone/marble/granite to shine through. Depending on the condition of the stone surface and the type of finish the client requests, the service technicians determine what process to use. Smart Touch use cutting edge technology to polish marble which is manufactured by our international and refined systems designed by ourselves to achieve unrivaled and outstanding results in the marble cleaning industry. We have various systems that we use for marble floor cleaning and for natural stone surfaces that are scratched, dull, or badly worn. 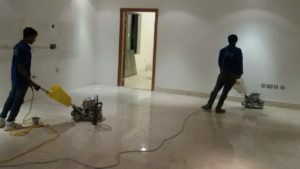 With our specialist skills we believe that we can only add strength to your cleaning and maintenance operations which will give you peace of mind with regard to handling marble/granite/stone materials, while at the same time giving your clients further confidence in your established relationship. For more information and prices, call us at 055-897 7547 or 04-3383 744.